Start off by introducing your toolkit and explaining what each tool is and what their functions are. Make sure they are aware of what’s sharp, what’s powerful, and how to properly hold each one. DIY can be dangerous, so it’s vital that they know which tools are which and that they must be used with care! All kids love to paint. Whether you do a lick of paint to cover up a mark or completely repaint your living room, they’ll want to get involved! Giving them tips and tricks is really useful, like how to keep a streamlined up and down motion, and doing corners when there’s less paint on your brush or paint roller. Show them how you would paint on your surface of choice with your explanation and let them repeat after you. They’ll pay lots of attention in the hope of doing it exactly like you! Using a heavy hammer to hammer sharp nails into in a block of wood could sound like a dangerous prospect, but with the right guidelines and materials you have nothing to worry about! Galvanised felt nails are ideal to use with a beginner as they’re short with wide heads. Additionally, instead of wood, rigid foam insulation is a great alternative, as it is much softer so the nails can go in more easily, so your kid is much more likely to – quite literally – nail it in one go! Explaining the danger of a sharp saw is crucial. It is important to teach the child the best way to grip the handle of the saw so that they are as far away from the sharp edges as possible. Using a foam core is much more child friendly, and by fixing it to a workbench it won’t move around, and your child can focus more on how to saw in straight lines. A drill is a very powerful tool! Using something less intense such as a powered screwdriver will lessen the impact and is easier to learn to coordinate. Wood you believe that screwing into drywall is much easier to drill into and you can always give your kid a wooden surface once you feel they are confident enough, and it can act as a reward! As the winter turns into spring, you might like to spend more time in the garden. Craft ideas for kids will keep the children busy over the warmer period and decorative bird feeders need not be overly difficult to make. This family project helps you create your very own wooden bird box that will stand out, and you can keep the kids occupied with its simple design and help them turn it into their favourite animal! We hope you find these bird box design ideas useful. The approximate costs of these materials are around £40. Head here to see a guideline ManoMano shopping basket where you can find some of the materials used. It’s a great project to do if you already have some wood lying around. From start to finish it shouldn’t take you any longer than a couple of hours to complete (depending on your experience). Think about the size of your bird box. I opted for something that was 20cm wide by 30cm but it really depends on your preference. I chose plywood because it is quite cheap and at 18mm thick it shouldn’t be too flimsy- remember it is going to be out in all weathers. If you do go for the same thickness, make sure that your panel pins are long enough to bite into the adjacent wood. Cut these using a handsaw or a jigsaw. Try to be as accurate as possible so that you make a nice even box. Use the panel pins to hammer together. It might be easier to enlist the help of a friend to hold them together…just a thought. You now have the back and sides of the bird box. You’ll want to make the front of the box. It will be broadly speaking the same dimensions as the back of the box. However (and this is the fun bit) you could add some detail to make your bird box stand out. Why not add a pair of ears to make it look like a cat or, like I did, an owl. Using a pencil, add the detail and then cut round that using the jigsaw. I kept it very simple and just added two triangles in the corner- although I did ‘jagger’ up between the two ear tufts to make it look like feathers. If when you run your fingers round the cuts of the bird box it is jagged then you can sand the edges to avoid splinters. As the birdbox is going outside and it is made of wood, you will need to preserve it. Decide on a colour (I went for Country Cream from Cuprinol’s Colour range) and paint it all round. To stop splash backs, make sure to do this on some newspaper and maybe use a couple of wood off cuts to stop the box sticking to the paper. Let it dry and then give it another coat. Once dry, you’ll want to attach the front to the rest of the box. You need to be able to remove the front as you might need, from time to time, to maintain or clean the box. I went for a pair of butterfly hinges. Get someone to help you line them up. Use a pencil to mark the holes of where you want to put the hinges. Then use a thin wood drill bit to drill pilot holes. This should mean that the screws screw in nice and easily. Do the same on the front of the box and screw in the screws. The ‘door’ that you have now created should open and close smoothly and easily. So that the door doesn’t just open when it feels like it, you need to find a way of fastening it. The simplest way is using a hook and eye. Twist the ‘eye’ in to the side of the door (opposite side to the hinges). If you find it hard then perhaps draw a pilot hole first. Then insert the hook and lead it back until the door closes. Twist the second ‘eye’ into the side of the box. You need to make an entrance for the birds and you can do this by using a holesaw attachment on your drill. Depending on your make of drill this is usually quite simple but be sure to check the manufacturer’s instructions. Using a regular wood drill bit (approx 6- 8mm) drill a hole just under the entrance to make a perch. Make the hole just slightly smaller than the dowel or bamboo stick you are inserting. Like that you can push the bamboo through and it will pinch nicely, meaning that you shouldn’t need to stick it. Let your artistic side run away with you. Use a thin brush and some black wood paint to make the design. There are loads of good design ideas online if you are stuck for ideas. That’s just about it- all you’ll need to do is to drill a hole in the back and attach the box to a tree or somewhere stable. Remember that this box is quite heavy so don’t place it anywhere where it could easily fall! This article was written by our guest blogger Lauretta from Home and Horizon. She shares thrifty tips and deals on interiors and travel and believes it’s all about cutting costs – not corners! To prepare your egg, you can either boil it, or blow it out. To blow out an egg, poke two small holes at either end using a pin. Enlarge this hole using a needle or piece of wire, then break up the yolk inside by poking around. Blow out your egg with a straw. For this step, you can use a pre-bought dye or simply paint the shells. If using dye, submerge your eggs according to the instructions, then remove. For the easy way out, you can just paint your eggs in various shades of green! Balance your eggs using an egg cup or the lid of a bottle. Draw on different designs with a black felt tip. You can get creative here – swirly lines, crosses, dashes… You can’t really go wrong! If you want to, you can use tissue paper to create some flowering cacti. Cut layers of tissue into small circles, and attach the layers with glue, scrunching a little before sticking. If you want to layer your eggs, just use hot glue to attach them. You’ll need to blow your eggs out for this, and remove a little of the shell to adhere them properly. Take flower pots, and fill the bottom with sand. Add some gravel as stability, and pot your eggs. It’s National Home Improvement Week and we’ve teamed up with different makers to bring you six projects to improve your home! These DIY projects are all suitable for beginners, and so everyone can get involved. Bring the rainbow to any bedroom, children’s or not (no judgement here) with this painted rainbow by interior designer Melanie Lissack. Who doesn’t want a light that looks like a volcano?? Check out this creative project by Out Of The Woods! With just a little twine or rope and a handy hot glue gun, MakeItSoph shows us how easy it is to upcycle a simple plant pot into something creative and unusual! Don’t throw away your corks – recycle them into an amazing wall art decal like Nino from Nin0craft. You can transform them into any shape you like! A simple thing like evaluating the size of objects in your house, and making sure each space is utilised in the best way, can be greatly beneficial in improving your home. 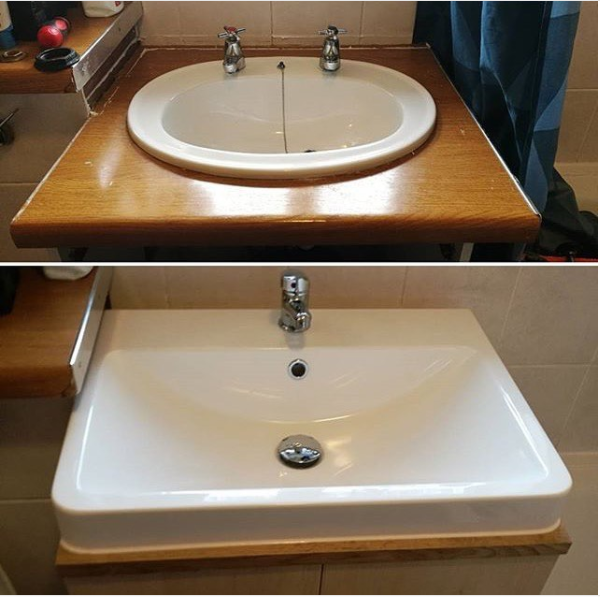 KK Makes shows us with her sink makeover! Fed up of your chargers, wires and remote controls lying around everywhere? Well, Joe from Average Joe’s Joinery has come up with the perfect DIY side table – it has storage for your (one too many) remotes and an integrated power socket! Who doesn’t love Lego?! What better way to display your favourite pieces than on this custom made Lego shelf. This is also fully adaptable as a display piece for other small items. Home Improvement doesn’t mean solely taking on huge projects. It can be the simple act of finding something you already own and embellishing it a little, or switching out one item that’s been getting on your nerves. This week, for National Home Improvement Week, why don’t you find a project to do around the house? If you do make or upcycle something, we’d love to see! Feel free to send us photos via our Facebook page, or the ‘Contact’ page on our site.